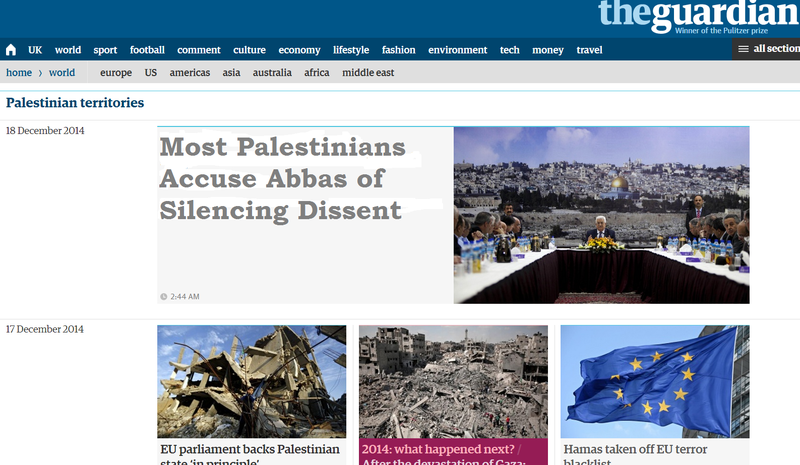 Do you note anything out-of-place in this snapshot of the Guardian’s Palestinian Territories page from Dec. 18th? Well, if you looked askew at the lead story (‘Most Palestinians Accuse Abbas of Silencing Dissent’), that’s because it wasn’t really published at the Guardian. We photoshopped out the real lead story (Palestinians open door to negotiation after submitting draft UN resolution) and added a Dec. 17th AP story that you might see if the Guardian took Palestinians seriously as agents of their own fate, and devoted space to critical investigations into Palestinian government. Here are some excerpts from the AP story demonstrating that most Palestinians accuse President Mahmoud Abbas of silencing dissent. Two-thirds of Palestinians say they are afraid to criticize Mahmoud Abbas, according to a poll, and some of the Palestinian president’s recent actions only seem to confirm claims that dissent comes at a price. Last month, Abbas outlawed the West Bank’s largest labor union and briefly jailed its two leaders for organizing strikes. Security agents routinely monitor social media and send threats or complaints to some of those criticizing Abbas. Meanwhile, the Palestinian leader’s Fatah movement continues to purge supporters of an exiled rival. Critics say that after a decade in power, Abbas is overseeing a largely authoritarian system with shrinking room for dissent — a claim denied by Abbas supporters who say Palestinians enjoy more political freedoms than most in the Arab world. …according to a poll published last week by the independent Palestinian Center for Policy and Survey Research. Sixty-six percent said they believe they cannot criticize Abbas without fear, according to the survey among 1,270 respondents, with an error margin of 3 percentage points. One recent controversy centered on the largest Palestinian union, which represents about 40,000 employees of the Palestinian Authority. Last month, Abbas outlawed the union and had two top officials jailed for a week. The decision followed strikes by the union demanding more benefits. Guardian editors won’t publish this AP story, and their Jerusalem correspondent, Peter Beaumont, will not investigate the broader problem of human rights violations by the PA because, as Matti Friedman noted in his groundbreaking essay at Tablet Magazine, reporters “working in the international press corps here understands quickly that what is important in the Israel-Palestinian story is Israel”. If you follow mainstream coverage”, Friedman added, “you will find nearly no real analysis of Palestinian society…”. As the Israeli elections move closer, we can likely expect Guardian “expert analyses” on the Jewish state’s putative dangerous lurch to the right, but nothing on the continuing violations of basic political freedoms under the authoritarian government of the Palestinian “President” currently serving his tenth year of a four year term. And this is the saddest thing about these so called Palestinian or even Arab supporters. The shalowing of societies into “us and them” stereotypes creates fertile ground for facsist like ideologies of all kind. We can even see it in Israel, for example in the recent Lehava organisation’s attitude and activities. I’m sure they can find some angle with which to blame the stifling of dissent on Israel. After all, Abbas is Israel and US’ puppet, no? Could someone at the Guardian please explain at what occasion the photo to the right of the headline was snapped? It looks like a banquet being held on a flying carpet. The PA: “…a final peace deal with Israel” – and here it is! Some one must get Dannon a better PR spin dr. Thanks for reminding us of what newspapers used to do. ‘Abbas is overseeing a largely authoritarian system with shrinking room for dissent — a claim denied by Abbas supporters who say Palestinians enjoy more political freedoms than most in the Arab world’. Saying that Palestinians have ‘more political freedoms’ than other Arabs is hardly a measure of achievement, now, is it?